By any measure, New York City’s homelessness crisis broke every record during the final year of the Bloomberg administration. The already record-high homeless shelter population soared even higher, to more than 50,000 people per night. The number of homeless children bedding down in municipal shelters eclipsed historic levels, exceeding 20,000 for the first time in history. When the Coalition for the Homeless released “State of the Homeless 2013” one year ago, the number of homeless men, women and children sleeping in the New York City shelter system on any given night could nearly fill Yankee Stadium – with just a few hundred seats to spare. Today, even Yankee Stadium isn’t big enough: The number of homeless New Yorkers would not only fill every seat in the stadium, but some 1,300 more would be left outside to stand. As a result of Mayor Michael Bloomberg’s disastrous homeless policies and New York City’s worsening housing affordability and income inequity, Mayor Bill de Blasio has inherited a homelessness crisis unthinkable just a few years ago. Fortunately, the new administration can invest in solutions proven to reduce New York City’s still-escalating homeless population – building upon the crucial steps already taken by the mayor and his key officials to protect homeless children and families from harm. 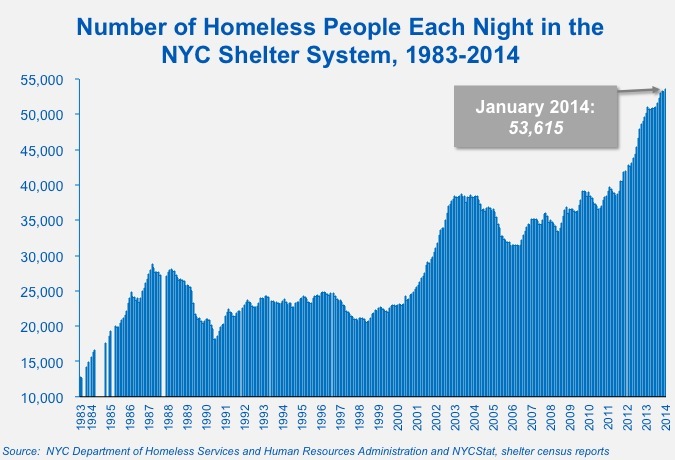 • Over the past year, the number of homeless people sleeping each night in the New York City shelter system increased by seven percent, from 50,135 people in January 2013 to 53,615 people in January 2014, the highest level ever recorded. • The number of homeless children increased by eight percent over the past year, reaching an all-time-high 22,712 children sleeping in homeless shelters in January 2014. • Average shelter stays for homeless families with children rose by a remarkable two months (60 days), or 16 percent, during the past year. The average shelter stay for a homeless family with children is now an alarming 14.5 months (435 days), the longest ever recorded. 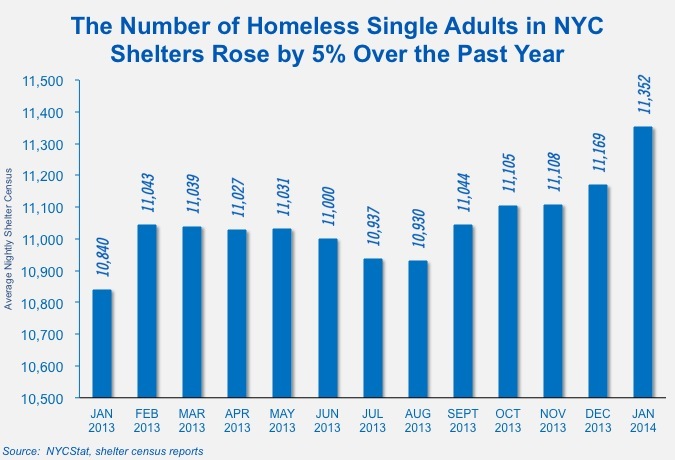 • Last year the number of newly-homeless families entering the shelter system rose by 12 percent, with 13,465 newly-homeless families entering shelters. • The number of homeless single adults sleeping each night in the New York City shelter system rose five percent to 11,342 women and men, a new all-time record. 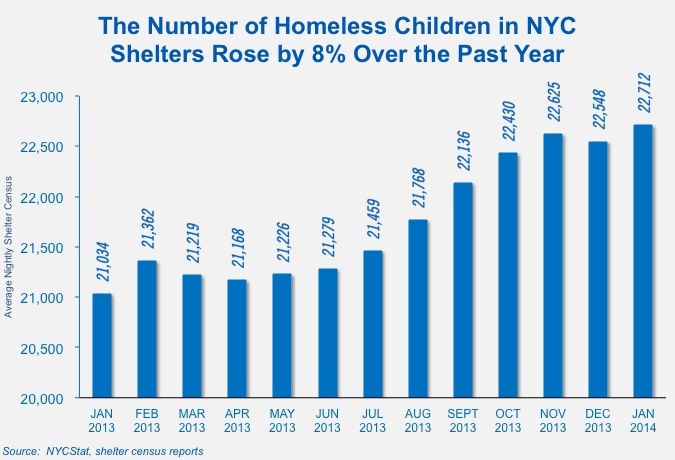 • Over the course of FY 2013, more than 111,000 different New Yorkers – including more than 40,000 different children – turned to the homeless shelter system, five percent more than the previous year. 1. Target long-term housing subsidies to help homeless families and children move from costly emergency shelter to stable, permanent housing – which will save taxpayer dollars squandered on stop-gap measures. Long-term housing subsidies to help families transition to permanent housing could reduce the number of homeless families with vulnerable children in shelter by 66 percent over four years. 2. Convert “cluster-site” shelter units back to permanent housing, significantly reducing family homelessness and phasing out this wasteful program. 3. Invest in the creation of new permanent supportive housing for homeless people living with mental illness and other disabilities – another cost-effective measure that saves $10,000 per person annually. 4. Improve access to emergency shelter to prevent harm to vulnerable homeless children, youth, and adults. 5. Enhance homelessness prevention efforts through cost-saving homelessness prevention programs and better coordination of services. 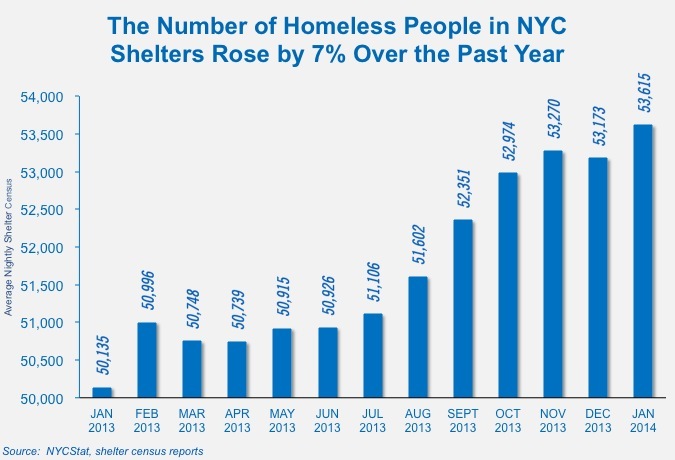 By every conceivable measure 2013 was the worst in modern history for New York City homelessness – and unquestionably among the worst since the Great Depression of the 1930s. 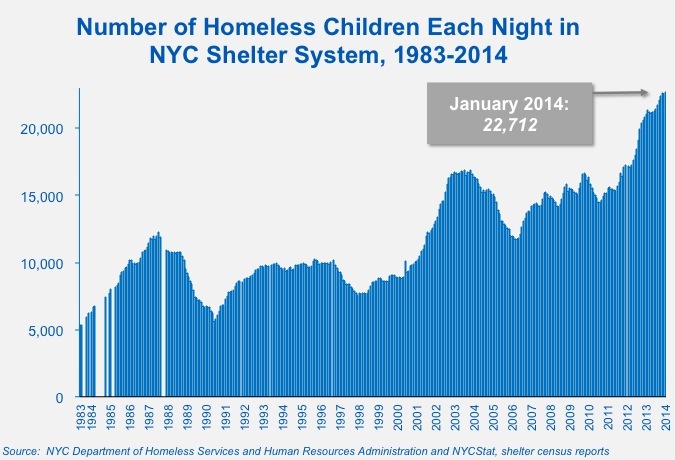 Homelessness in NYC soared to previously unimaginable new highs as more newly homeless families entered the shelter system, the number of homeless single adults in shelters broke records, and homeless families with children languished in the shelter system for longer than ever. 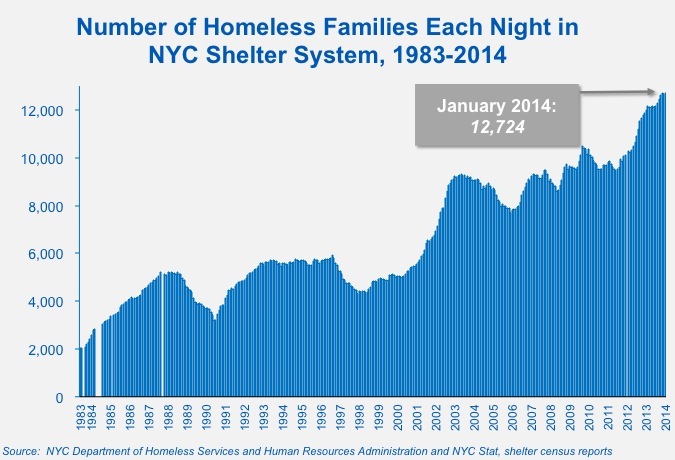 • Over the past year, the average monthly number of homeless people sleeping each night in the New York City shelter system increased by 7 percent, from 50,135 people in January 2013 to 53,615 people in January 2014 – the highest level ever recorded. • The average number of homeless children living in municipal shelters increased by 8 percent over the prior year, reaching an all-time-high 22,712 children in January 2014. • The average number of homeless families in shelters increased by 6 percent over the past year, reaching a record-high 12,724 families in January 2014. 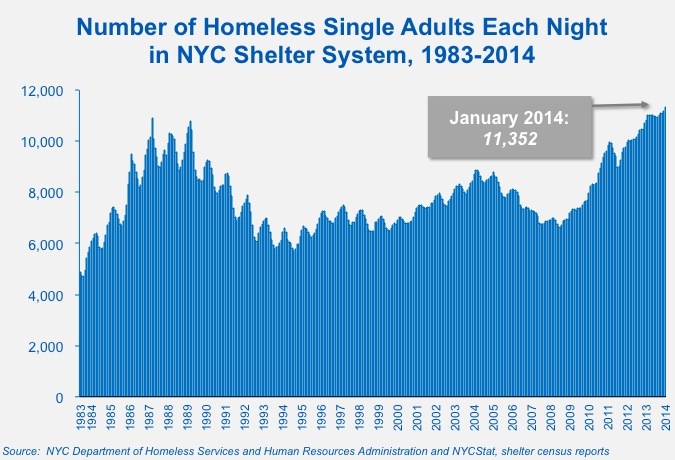 • The average number of homeless single adults sleeping each night in the New York City shelter system rose five percent to 11,342 women and men in January 2014, a new record. • Average shelter stays for homeless families with children rose by two months (60 days), or 16 percent, during the past year. 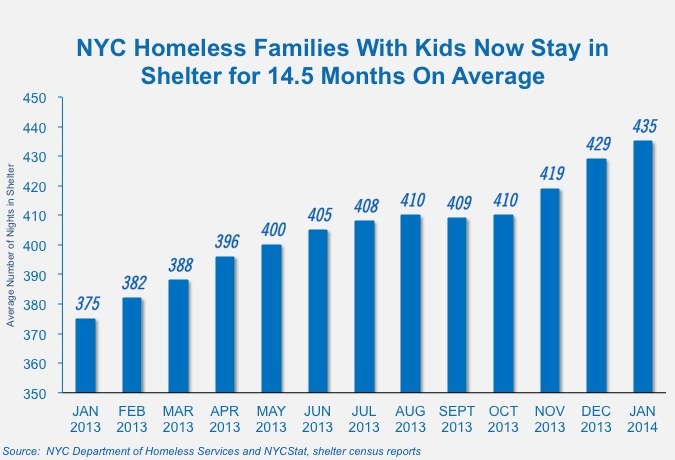 The average shelter stay for homeless families with kids reached a record-high 14.5 months (435 days) in January 2014. • The average shelter stay for homeless families without children rose to more than 17 months (518 days), the longest ever recorded. Average shelter stays for childless families in emergency shelter rose by more than a month (34 days), or 7 percent, during the past year. • The number of newly homeless families entering the shelter system, 13,465 families in FY 2013, was 12 percent higher than the previous City fiscal year. 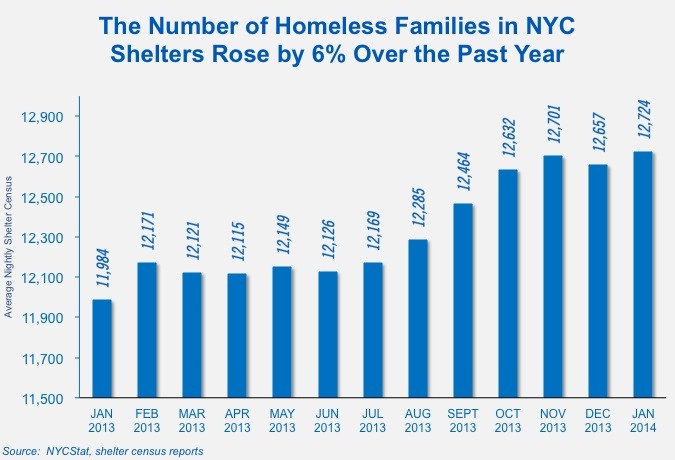 • More New Yorkers sought emergency shelter: A remarkable 111,210 different men, women and children slept in the shelter system during FY 2013, a five percent increase over the previous City fiscal year. 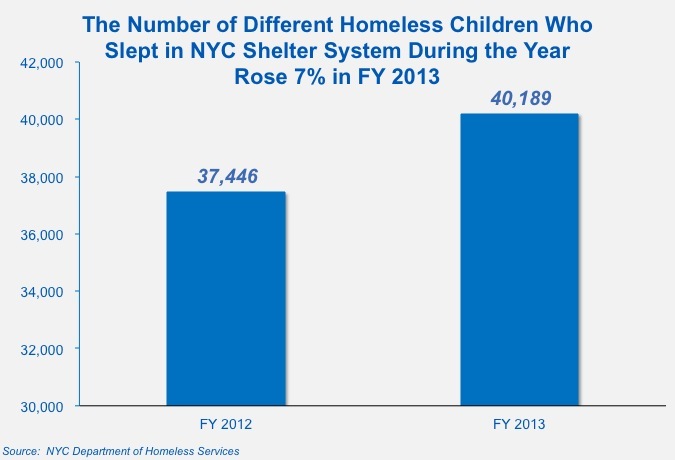 • More children slept in NYC’s municipal shelter system: During FY 2013, City data show 40,189 different girls and boys lived in homeless shelters, a 7 percent increase from the previous City fiscal year. 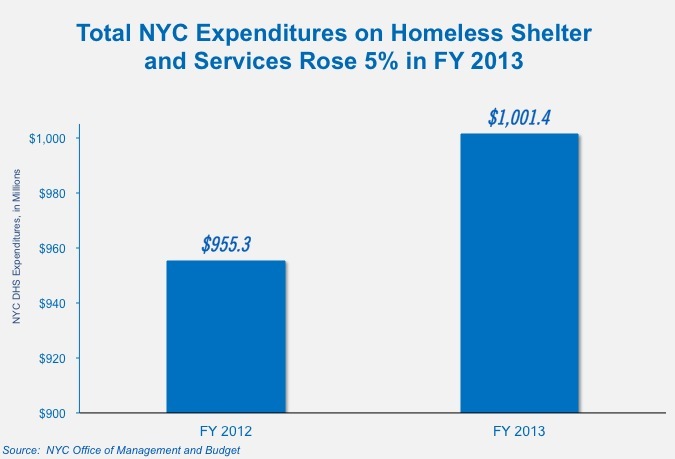 • As a direct result of rising homelessness, New York taxpayers continued to pay more. In FY 2013 the City spent more than $1 billion on homeless shelter and services, a five percent increase over the previous year. • The average annual cost to shelter a homeless family, $37,603 in FY 2013, up two percent from the previous fiscal year. • The Bloomberg administration dramatically expanded the use of for-profit shelter operators. 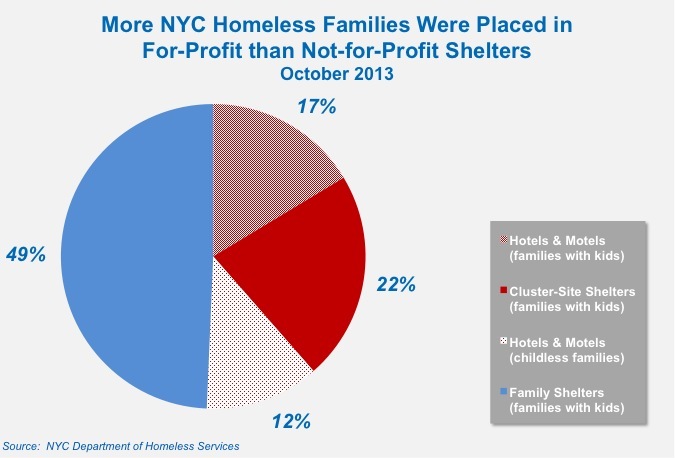 The majority of homeless families (51 percent) in New York City reside in for-profit shelter (i.e., commercial hotels and motels and so-called “cluster-site” shelter units). While Mayor Bloomberg’s failed homeless policies played a major role in causing New York City’s historic homelessness crisis, the widening gap between apartment rents and the incomes of poor New Yorkers also fueled the current crisis. Housing costs soared during the Bloomberg era – including the Great Recession – while wages and incomes for most New Yorkers fell or stagnated. New York City’s housing affordability crisis continues to worsen and presents significant challenges to the de Blasio administration as it shapes homeless policy for the years ahead. • Both the number of poor New Yorkers and the poverty rate have risen in recent years, according to U.S. Census Bureau data. • Currently more than one-in-five New York households are living below the federal poverty line ($19,790 in annual income for a family of three). • In 2012 (the most recent year for which Census Bureau data is available), the poverty rate in New York City rose to 21.2 percent – up from 20.9 percent the previous year, and up from 20.1 percent in 2010. • Nearly one-in-three New York City children are living below the poverty line. 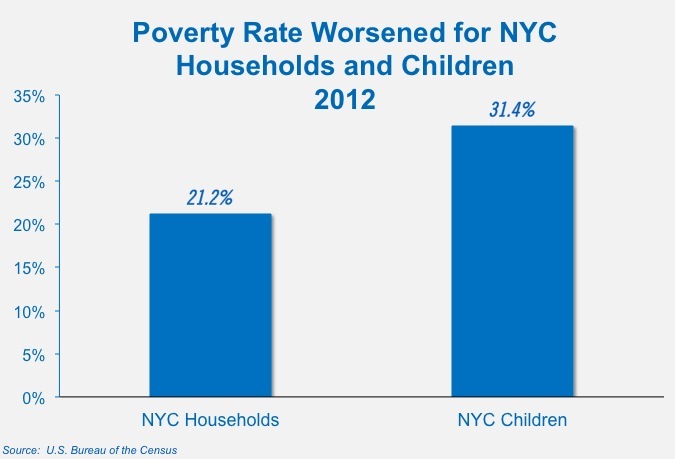 In 2012 the poverty rate for New York City children was 31.4 percent. 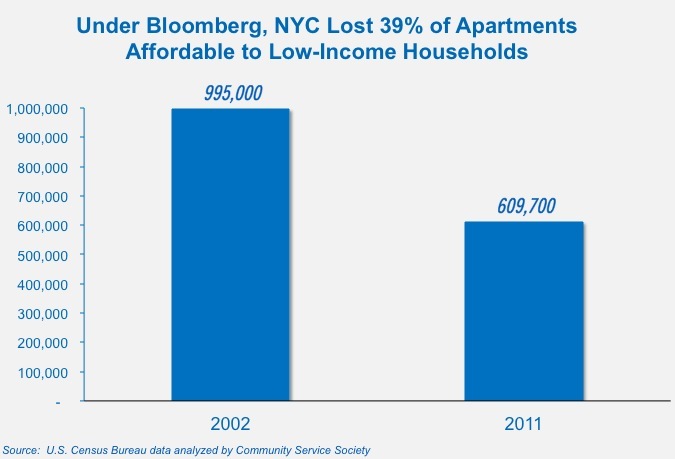 • During the Bloomberg era, New York City suffered dramatic losses of apartments affordable to low-income households. From 2002 to 2011, according to Census Bureau data, New York City lost 39 percent – 385,300 apartments – affordable to households earning below twice the poverty line ($39,580 for a family of three). • New York City also continued to lose subsidized housing. Since 1990 NYC lost 33 percent of all privately-owned subsidized housing (project-based Section 8 buildings and Mitchell-Lama buildings). 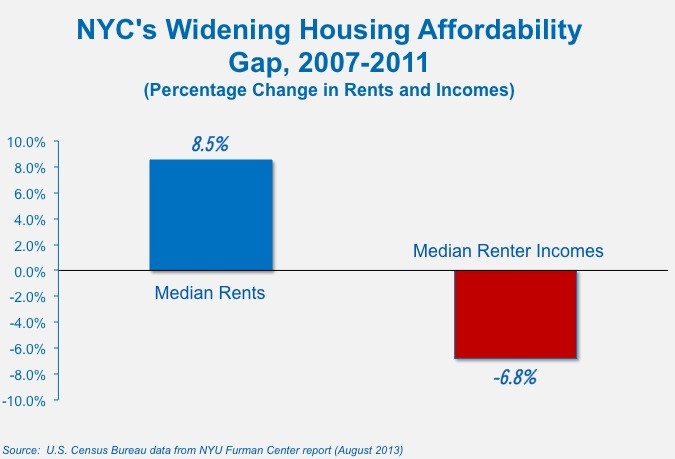 • While New York City continues to hemorrhage affordable rental housing, renter incomes have also fallen. According to U.S. Census Bureau data, during the Great Recession (2007 to 2011) median apartment rents in New York City rose by 8.5 percent while median rent incomes fell by 6.8 percent. • The gap between incomes and rents grows wider. 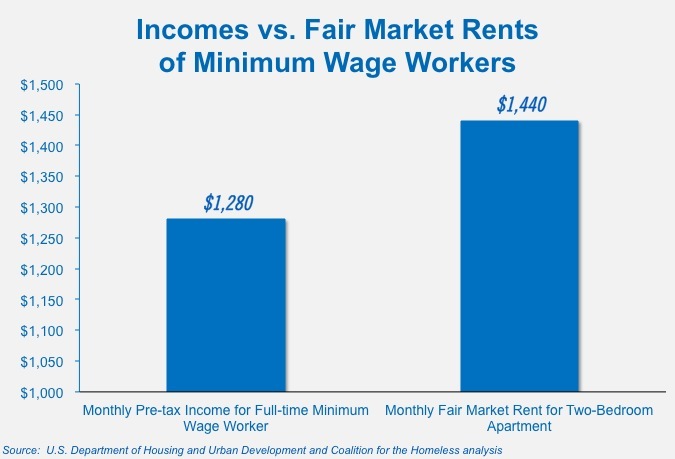 A New Yorker earning the minimum wage and working 40 hours/week earns $1,280/month (before taxes), while the federal Fair Market Rent for a one-bedroom apartment is $1,215/month and for a two-bedroom apartment in New York City is $1,440/month. 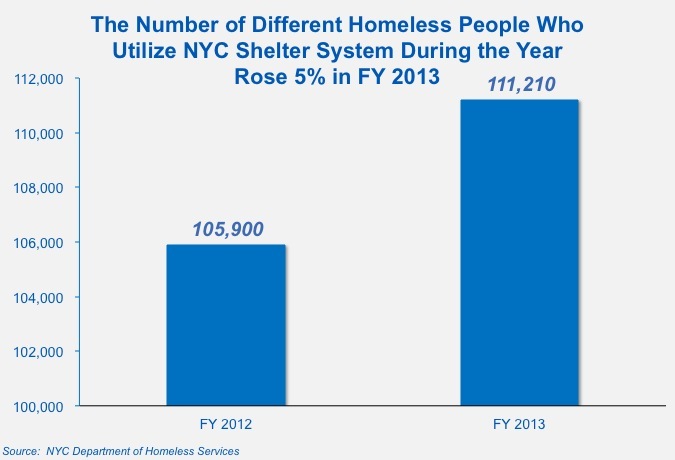 • The number of working New Yorkers who are homeless has risen dramatically. From November 2010 to July 2013, according to City data, the number of working families and individuals in municipal shelters rose by 57 percent. 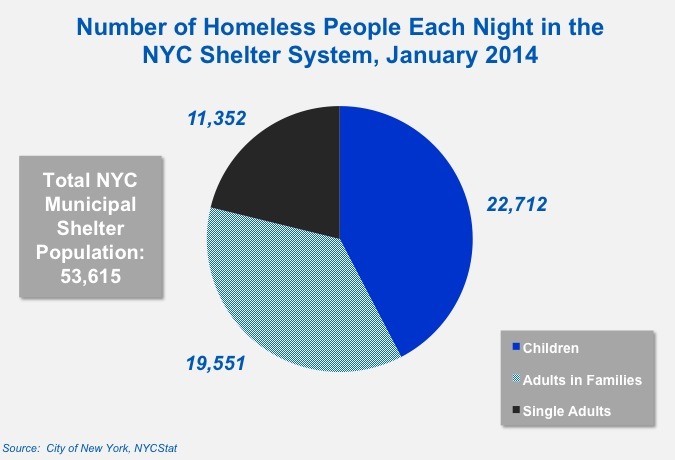 • More than one of every four homeless families in the New York City shelter system (28 percent) is headed by a working adult and one of every six homeless single adults in shelters (16 percent) is working. • On January 1st, Deputy Mayor for Health and Human Services Lilliam Barrios-Paoli re-instated “Code Blue” shelter for homeless families seeking shelter during freezing weather. This action reversed the dangerous and much-criticized Bloomberg policy that turned away families from shelter intake during sub-freezing cold. • Mayor de Blasio’s FY 2015 preliminary City budget plan provides long-overdue help to homeless and low-income New Yorkers – reversing several misguided cutbacks leveled by the Bloomberg administration. Specifically, de Blasio’s budget plan eliminates $52 million in annual payments from NYCHA to the NYPD, freeing up significant funds for public housing maintenance and repairs; requires recipients of HIV/AIDS housing benefits pay only 30 percent of their income towards rent; and funds additional shelter beds for homeless and runaway youth – a woefully underserved population. • In February 2014, the de Blasio administration took definitive action to begin relocating more than 400 homeless children from two notorious City-run shelters long neglected by previous administrations. In the wake of the New York Times’ landmark five-part series documenting the life of 12-year-old Dasani Coates and her family, Mayor de Blasio ordered that homeless families with children be removed from the Auburn Family Residence (where Dasani and her family lived for three years) and Catherine Street Family Shelter. Both facilities are directly operated by the NYC Department of Homeless Services and have been cited by City and State inspectors with hundreds of violations of health and safety standards. While these are important steps forward, reversing the damage of the Bloomberg era will require more comprehensive policy changes – most importantly, ensuring that homeless families and individuals can transition to permanent housing. The five most important solutions that Mayor de Blasio and his administration can implement to turn the tide of misery of homeless New Yorkers are detailed below. THE PROBLEM: In perhaps his most devastating policy failure, Mayor Bloomberg removed long-term permanent housing options for homeless families and children. 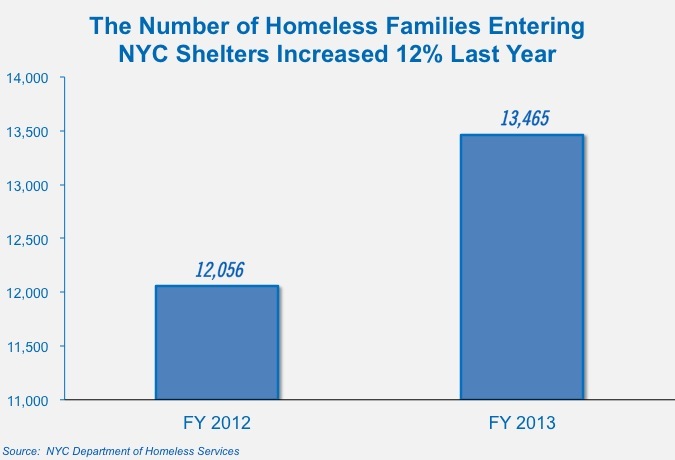 Predictably, New York City family homelessness soared. • Previous New York City mayors – from Ed Koch to David Dinkins to Rudy Giuliani – targeted Federal and City housing resources to move homeless families out of expensive, emergency shelters into stable, permanent housing. Beginning with Mayor Koch, NYC helped homeless families re-locate to permanent housing by allocating a modest share of scarce federal public housing apartments (administered by the New York City Housing Authority, or NYCHA) and federal housing vouchers, known as Section 8 vouchers. 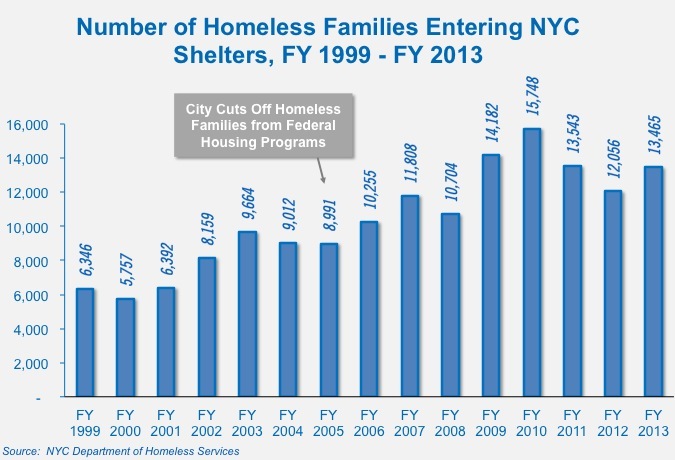 • From FY 1990 through FY 2005, the City helped more than 53,000 homeless families – including more than 100,000 children – move to long-term, permanent housing using these Federal housing programs. Over the same period, an additional 11,000 homeless families with more than 20,000 children moved from shelters to City-subsidized apartments – many of them apartments created under the late Mayor Ed Koch’s acclaimed “Housing New York” ten-year plan. • In 2005 the Bloomberg administration eliminated priority use of federal housing programs (public housing and Section 8 vouchers) for homeless children and families. • Bloomberg replaced those proven, successful federal programs with wasteful, ineffective short-term rent subsidy programs (Housing Stability Plus and Advantage) – and ultimately the termination of all housing assistance for homeless families in March 2011. • By his final term, Mayor Bloomberg had eliminated all housing-based policies that helped homeless families rebuild their lives in stable, permanent homes. Eliminating permanent housing options triggered longer shelter stays – average shelter stays for homeless families with children have soared to 14.5 months (435 days) – and resulted in record numbers of families making repeated trips through the costly shelter system. • City data show that half of all Advantage families whose rental assistance subsidies expired or were abruptly cut – more than 8,500 families with 18,000 children – had already returned to the shelter system as of last August, and more than 200 former Advantage families continue to enter the shelter system each month. A recent analysis by Coalition for the Homeless found that former Advantage families forced to return to shelter have cost at least $287 million in avoidable emergency shelter expenses. • The short-term Advantage program did not provide the stability of proven, long-term housing subsidies. As a result of the program’s poor design, nearly two-thirds (63%) of all families currently entering the shelter system are formerly-homeless. 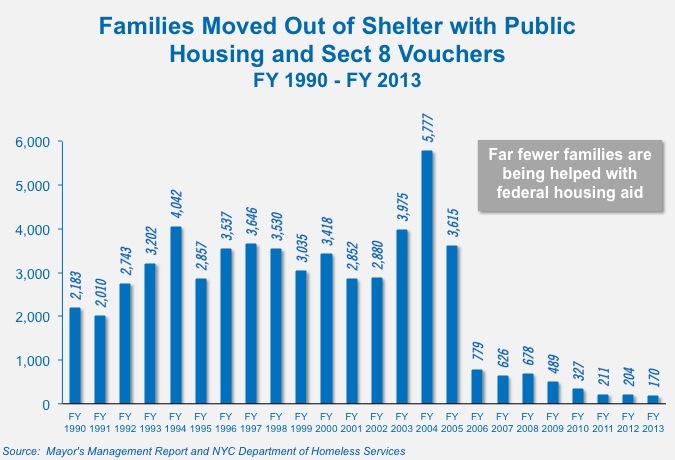 In contrast, prior to 2005 – when New York City utilized priority referrals for NYCHA public housing and Section 8 vouchers to assist homeless families – only one-in-four families entering shelter were formerly-homeless. Put simply, long-term housing subsidies are the most effective investment to reduce the number of families re-entering the shelter system, and thus the most powerful tool to reduce the family shelter census. THE SOLUTION: Mayor de Blasio can restore long-term housing subsidies for homeless families and children – driving down the shelter census and saving taxpayer dollars. • Long-term housing subsidies not only increase the number of homeless families leaving the shelter system, but over time also reduce the number of families entering the shelter system. • Overwhelming research and evidence documents that long-term housing subsidies – public housing, Section 8 vouchers (or similar rent subsidies) and City-subsidized apartments – not only help homeless families leave the shelter system, they also remarkably lower the rates of return to shelter. Long-term housing subsidies save taxpayer dollars otherwise spent on the costly shelter system. 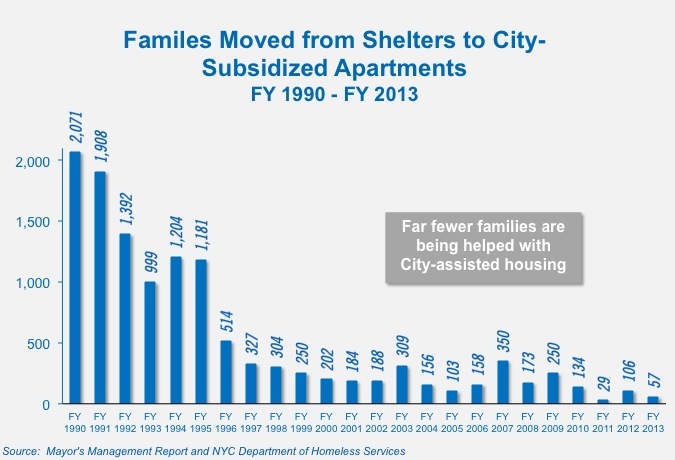 • The short-term subsidies designed by the Bloomberg administration (the Housing Stability Plus and Advantage programs) created a revolving door back to the shelter system for thousands of families and children – and ultimately cost taxpayers more in shelter expenses. 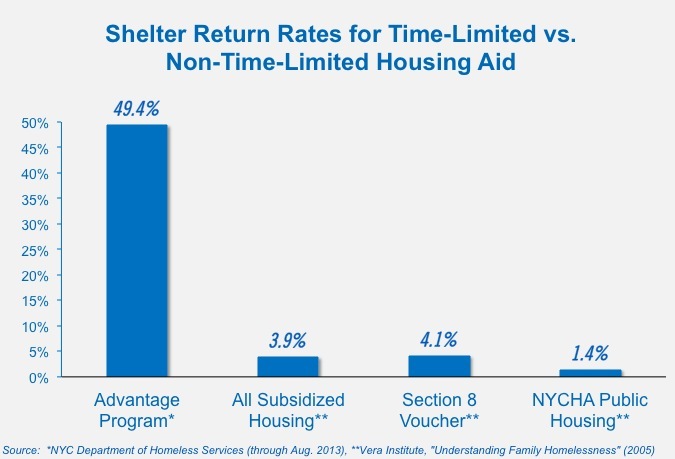 • The NYC Independent Budget Office (IBO) found that resuming priority referrals of homeless families to NYCHA public housing and Section 8 vouchers “would result in a net reduction in the family shelter census” and would save millions of dollars spent on shelter. The IBO estimated shelter savings of $14.7 million by providing 2,500 families with NYCHA public housing placements and/or Section 8 vouchers. • Numerous research studies have found overwhelmingly that Federal housing programs successfully reduce family homelessness. • The Vera Institute’s major study on NYC family homelessness found that fewer than four percent of homeless families who left shelter with long-term housing subsidies had returned to shelter five years later – and only 1.4 percent of families placed into NYCHA public housing had returned to shelter five years later. a. Resuming priority referrals of homeless families to New York City Housing Authority public housing apartments and Section 8 vouchers. Resume priority referrals of at least 2,500 eligible homeless households per year to the NYCHA public housing waiting list. Resume referrals of eligible homeless households to Section 8 voucher waiting lists, such that homeless households can obtain at least one of every three available vouchers. Reinstate the NYCHA waiting list priority status previously granted to homeless applicants for both the public housing and Section 8 voucher programs. Target at least one of every five vacancies in existing housing units funded by the NYC Department of Housing Preservation and Development to homeless families and individuals. b. Creating a new City-State rental assistance program for homeless New Yorkers to supplement existing Federal and City housing resources. Ensure housing stability for homeless families who have members with disabilities or other barriers to employment and cannot otherwise afford decent housing after the five-year subsidy has expired. The Coalition for the Homeless estimates that 7,500 long-term housing subsidies per year to help homeless families secure permanent housing would reduce the family shelter census by an estimated 66 percent in FY 2018. If the City targets 5,000 long-term housing subsidies per year, by FY 2018 the family census could be reduced by 33 percent to 8,175 families. However, if the City relies on short-term subsidies (like the former Advantage program), even combined with some federal housing programs, by FY 2018 the family census would likely increase by 17 percent to 14,175 families. 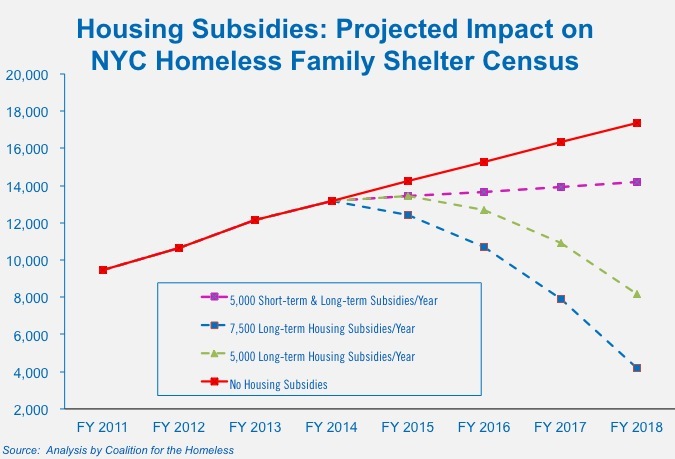 And with no housing subsidies whatsoever – a continuation of the Bloomberg-era policies – by FY 2018 the family shelter census could skyrocket by another 43 percent, to 17,370 families in shelter. THE PROBLEM: In the wake of Bloomberg-era disinvestment in permanent housing for homeless New Yorkers, NYC has taken more than 3,000 low-income apartments off the rental market for use as temporary shelter for homeless families – and pays exorbitant prices to do so. • The Bloomberg administration dramatically expanded the use of for-profit shelter operators. 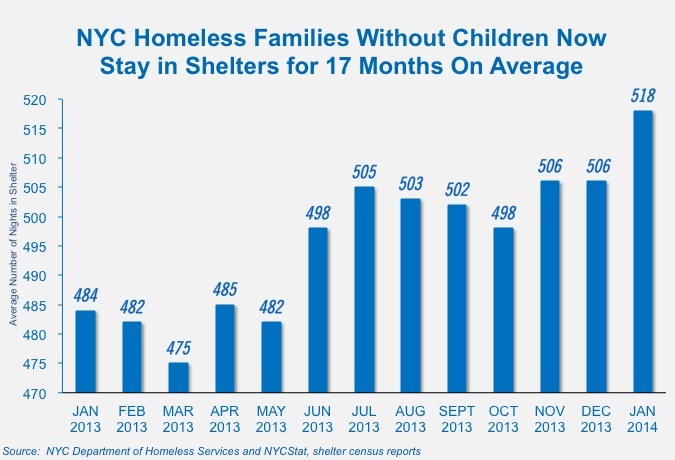 Currently the majority of homeless families (51 percent) in New York City reside in for-profit shelters (i.e., commercial hotels and motels and so-called “cluster-site” shelter units). • More than one of every four homeless families with children (26 percent) currently reside in “cluster-site” shelter – apartments used as temporary shelter. • As the Bloomberg administration eliminated all housing assistance for homeless families, the number of families sleeping each night in so-called “cluster-site” shelter units increased by a remarkable 90 percent – from 1,444 families in October 2010 to 2,751 families in October 2013. • The City pays exorbitant rates for the use of these apartments as shelter, in some cases as high as nearly $3,400 per month. Most of these apartments rented for $1,000 per month or less when lease-holding tenants resided in them. • The annual cost to taxpayers of sheltering a homeless family in a “cluster-site” unit is thus well over three times the annual cost of a Section 8-style housing voucher for the same family. • The Bloomberg administration’s expansion of the cluster-site program effectively removed thousands of scarce low- and modest-rent apartments from the already-diminishing stock of available, affordable rental units. Currently the City is using nearly 3,000 low- and moderate-rent apartments as temporary shelter instead of using them as permanent, affordable housing. • The City’s “cluster-site” program creates powerful, perverse incentives for owners to displace lease-holding tenants in favor of lucrative shelter deals with the City. • Move homeless families stranded in “cluster-site” units to permanent housing with priority referrals to federal housing programs. • Provide City-State rent subsidies to allow families in “cluster-site” units that meet Section 8 quality standards to secure leases for the very apartments in which they already reside. • Finally, the City should commit to a definitive public timeline to reduce – and ultimately eliminate – City reliance on “cluster-site” shelter while instituting strong deterrence measures to safeguard against the harassment of tenants in former “cluster-site” buildings by property owners. THE PROBLEM: Thousands of homeless families and individuals are living with mental illness and physical disabilities, in desperate need of permanent housing with support services. But the last City-State initiative to create permanent supportive housing created far too few housing units to meet the need. • Roughly one-third of homeless single adults in the New York City shelter system, and two-thirds of homeless people sleeping on the streets and other public spaces, are living with serious mental illnesses. Many more have other serious health problems and disabilities. • A significant number of homeless families – in particular families without children – need permanent housing with support services. • The last major City-State initiative to create permanent supportive housing was the 2005 “New York/New York III Agreement” – a step forward, but it created far too few housing units to meet the need. The “New York/New York III Agreement” created an average of 900 new supportive housing units per year, at a time of skyrocketing homelessness among both families and single adults. THE SOLUTION: Mayor de Blasio and Governor Cuomo must negotiate a “New York/New York IV Agreement” to create permanent supportive housing on the scale approaching the current massive need, which would not only serve thousands of the most vulnerable and needy New Yorkers, but would save millions in taxpayer dollars currently spent on stop-gap hospitalizations, emergency shelter, and other inefficient and wasteful expenditures. • More than 30 research studies nationwide have found that permanent supportive housing saves taxpayer dollars otherwise spent on shelter, hospitals, and other institutional care. • The NYC Department of Health and Mental Hygiene released a major study in December 2013 documenting that the “New York/New York III Agreement” resulted in average savings to taxpayers of $10,100 per person housed per year. • Mayor de Blasio and Governor Cuomo must negotiate a more effective “New York/New York IV Agreement” to create 12,000 units of permanent supportive housing over three years. • The agreement should create new affordable housing with support services for homeless individuals living with serious and persistent mental illness, homeless families with a family member living with serious and persistent mental illness, and homeless people with other special needs. THE PROBLEM: Mayor Bloomberg’s numerous attacks on New York City’s legal right to shelter made it more difficult for homeless children, youth, and adults to access life-saving emergency shelter and harmed many of the most vulnerable New Yorkers. • The Bloomberg administration intensified Giuliani-era punitive shelter access reviews for families seeking shelter, leading to record numbers of families being denied shelter. 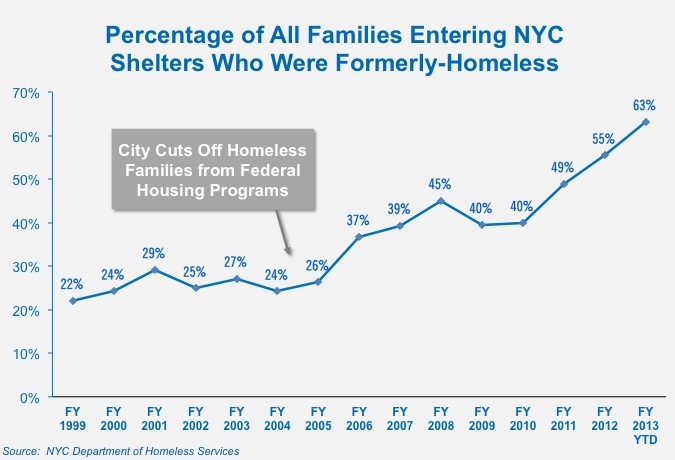 • In FY 2013 nearly half (46 percent) of all homeless families who were admitted to the New York City shelter system were forced to apply two or more times at the intake center in order to access stable shelter. During the same period, 22 percent of families admitted to the shelter system had to apply three or more times. • The bureaucratic and punitive shelter access review process – which can take weeks or even months in some cases – requires the entire family be present for each application. As a result, it forces many homeless children to miss a significant number of school days and many homeless parents to miss work. • The Bloomberg administration attempted to implement similar shelter access reviews for homeless single adults seeking shelter. The proposed rules would have denied shelter to an estimated 10,000 homeless adults each year, according to Bloomberg officials. Fortunately those rules were blocked by legal challenges brought by the Coalition, the Legal Aid Society and the New York City Council. • The Bloomberg administration implemented shelter termination rules that eject homeless families and individuals from shelter to the streets for 30 days or more and separate children from ejected parents. • The majority of the more than 700 homeless adults that the Bloomberg administration threatened with shelter termination sanctions are living with mental illness or other serious health problems. Pregnant women, mothers with infants and people with serious physical disabilities were routinely threatened with ejection from shelter to the streets. • For many years the City has failed to provide shelter for hundreds of homeless and runaway youth, many of whom are LGBT teens and young adults who became homeless due to anti-gay discrimination from their families. As a result, many homeless youth are forced to sleep on the streets or in other dangerous places. • Expand shelter and appropriate services to help all homeless and runaway youth come in, off the streets. • Immediately rescind proposed shelter denial rules for homeless single adults, and resolve litigation pending on the Bloomberg administration’s plans to implement these dangerous rules. • Immediately halt denials of shelter access in instances in which an applicant family is being directed to return to a NYCHA–administered or otherwise subsidized housing unit. Families would be denied shelter only when other housing resources identified are both actually available and appropriate to the needs of the family. In cases where there are disputes about the actual availability of a housing resource, assign a City worker to accompany the applicant family to the identified housing option to confirm, firsthand, if the family can indeed access that option. Eliminate the job title “fraud investigator” and mandate that City workers actively assist families in obtaining necessary documents and records for their applications. • Implement an immediate moratorium on all threats to terminate families or individuals from shelter –including the pending sanction notices issued in record numbers during Bloomberg’s last year in office – while working to revise sanction protocols and procedures. The overwhelming number of homeless New Yorkers threatened with sanction either need help re-establishing their welfare benefits or have severe and persistent (usually undiagnosed or misdiagnosed) mental illness. Eliminate shelter termination sanctions involving families with children and/or pregnant women. Eliminate shelter termination sanctions involving shelter residents with mental or physical impairments, or in cases where there is reason to believe such impairments exist. Require the City to undertake thorough medical and psychiatric evaluations of any homeless individual threatened with termination sanctions. Institute effective case management to match individuals with severe and persistent mental illness with supportive housing, rather than evicting them to the streets. THE PROBLEM: Despite growing evidence of the importance of homelessness prevention programs, these services remain woefully underfunded. Indeed many prevention programs suffered cutbacks in City and State funding during the steep rise in the number of New Yorkers facing eviction and subsequently seeking shelter. • Homelessness prevention services in New York City remain uncoordinated and underfunded, with at-risk households routinely forced to seek help from multiple public and not-for-profit agencies, the latter lacking adequate funding. • City data show that evictions are one of the major immediate causes of family homelessness in NYC, with more than one-in-four families who seek shelter doing so after an eviction. • The vast majority of tenants facing eviction in New York City’s housing courts do not have legal representation – while the vast majority of landlords do. • Homelessness prevention service providers also report that many tenants at risk of eviction, who merely need modest financial grants to pay rent arrears, are turned away by the NYC Human Resources Administration. • The City’s Homebase prevention programs, which provide some assistance with rent arrears grants, have seen their program model shifted several times in recent years and currently serve fewer at-risk households from the community. • The only homelessness prevention rent subsidy program – the Family Eviction Prevention Supplement (FEPS) program – has been hampered by unrealistic rent levels and cumbersome bureaucratic requirements that made it difficult to access for many needy families. • Many low-income tenants living with disabilities could benefit from the Disability Rent Increase Exemption (DRIE) program, but the Bloomberg administration stubbornly opposed program reforms that would make it more accessible to more at-risk tenants. • Coordinate prevention services among prevention agencies so that at-risk families and individuals know where to go to get help. • Enhance funding for anti-eviction legal services to help many more low-income tenants avert eviction in housing courts. • Increase funding for rent arrears, which will ensure that more families can avoid costly emergency shelter and remain in their own homes. • Negotiate with the State to administer the Family Eviction Prevention Supplement (FEPS) program at neighborhood welfare offices and/or other sites, to make the FEPS benefit more widely available to at-risk families. • Seek immediate approval from the State to increase FEPS subsidy rent levels equivalent to those in the Section 8 program. Remove restrictions that prevent families from accessing the FEPS subsidies, such as the requirement that the family be sued in Housing Court, exposing them to inclusion on the “Black Lists” at tenant screening bureaus. • Support State legislation to expand access to the Disability Rent Increase Exemption (DRIE) program by including families with a family member with disabilities who is not head of household (i.e., minor and adult children); all military veterans with disabilities; and former workers and disability income recipients with incomes up to $29,000 per year (equivalent level as recipients of the Senior Citizens Rent Increase Exemption program). • For the period before September 2011, data for homeless families and children is taken from DHS’s “Emergency Housing Services for Homeless Families Monthly Report,” which has been published by the City since the early 1980s. These DHS monthly report includes approximately 200 families (with approximately 1,000 people) who reside in homeless shelters currently administered by HPD. • For the period before September 2011, data for homeless single adults in municipal shelters is taken from the following DHS reports: (1) DHS daily census reports for shelters for homeless single men and women, which have been produced daily by the City since 1982; (2) DHS census reports for shelters for homeless veterans; and (3) DHS census reports for “safe haven” shelters, which are restricted to long-term street homeless adults. (Note that the large majority of shelters for veterans and “safe haven” shelters were once included as part of the DHS daily adult shelter census report. These shelters were “converted” to different service models beginning in 2007 and were then excluded, in various stages, from DHS daily adult shelter census report and from DHS’s website.) Data for homeless single adults also includes data for homeless people sleeping in DHS shelter “stabilization beds,” which are also restricted to chronically street homeless adults since July 2010 – this data is taken from DHS “Critical Activities Reports,” available on the DHS website. • Data on rents and tenant incomes is from the U.S. Census Bureau and included in reports by the Community Service Society, available athttp://www.cssny.org, and New York University Law School’s Furman Center for Real Estate and Urban Policy, available at http://furmancenter.org/. • Data about Federal housing programs and other housing subsidy programs is from the City of New York, Mayor’s Office of Operations, the “Mayor’s Management Report” for various years available at http://www.nyc.gov/html/ops/html/home/home.shtml, as well as from DHS “Critical Activities Reports,” available on the DHS website (www.nyc.gov/dhs).